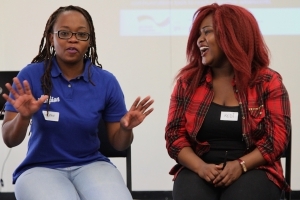 HIVSA (Choma): CTAOP provided lead funding and continues as the primary funder for HIVSA’s innovative project Choma, a mobile phone “magazine” targeting young women and girls throughout South Africa. Choma provides these young people with interactive and relevant sexual and reproductive health information through the use of social media and mobile phones. Choma Dreams Cafés: Together with PEPFAR, CTAOP is providing lead funding for HIVSA’s Choma Dreams Cafés, safe spaces for 12,000 adolescent girls at 50 community-based organizations and schools. This project will set up girl-friendly youth hubs to facilitate links to SRH and health services, both in the physical space and online via Choma Magazine. As part of PEPFAR’s larger DREAMS initiative, the adolescent girls and young women will already be receiving combination prevention services from USAID supported DREAMS partners. This project has the potential to reach the entire country and addresses issues of stigma, confidentiality, and anonymity by using a mobile phone platform. Content is dynamic and adapts to the changing adolescent landscape, while providing a safe space for young people to get correct information, link to services, and connect to peers.